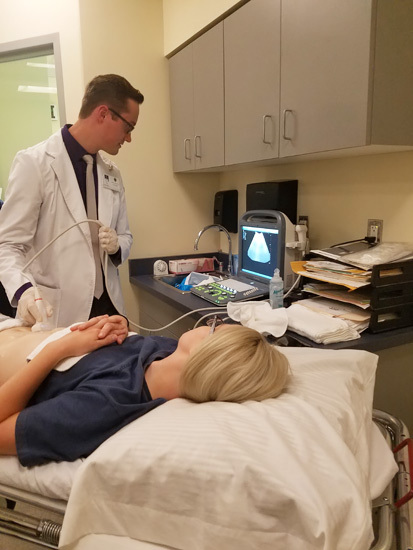 MSU BILLINGS NEWS SERVICES — Montana State University Billings recently shared its ultrasound program facilities with Rocky Mountain College (RMC) to train physician assistant (PA) students. Dr. Victor White, instructor of radiologic technology at City College, and Jenna Andujar, radiologic technologist at Saint Vincent Healthcare, taught the group of students how to use two different types of ultrasound machines and then instructed them on how to perform a Focused Assessment using Sonography in Trauma (F.A.S.T.) Scan with the equipment. The hands-on training will allow students from RMC to utilize the method on trauma patients in the emergency room or perform the scan at any clinic or hospital. White reached out to the Physician Assistant Program Director at RMC last summer about offering the training and, after the college expressed interest, was referred to Dwight Harley, one of the PA program instructors. The first seminar was held on two afternoons in the summer of 2017 and the event was made annual after the success of the first session. This is the second summer that the PA students at RMC have been instructed on the F.A.S.T. Scan at City College. White and Harley plan on continuing to hold the seminar annually and White plans to collaborate with Riverstone Health on how to perform the F.A.S.T. Scan and other ultrasound procedures in the future. For more information, contact Dr. Victor White at victor.white@msubillings.edu or 247-3086.